No matter what you’re going through, there is nothing too difficult. Annette Newcomb is a cancer survivor who has battled with mental health issues throughout her life. 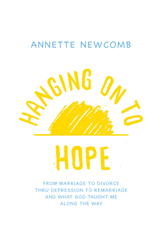 Newcomb credits her close relationship with God as her reason for staying positive throughout many health and marriage difficulties. Newcomb is a medical transcriptionist who currently lives in Palm Desert, California, with her husband and enjoys spending time with her three sons and dog.